It’s just 31 days before my NPC competition in San Diego. Yes, I am counting down them down – but only because I was a little less dedicated during my first four weeks on being on the program than I should have been. My trainer says you won’t see a lot of change in your body the first four weeks, but considering I have to be show-worthy in just a few weeks from now, I’m starting to worry. Although I’m really hoping she’s right. Each morning I wake up hoping a miracle happened and my body finally realized that it needs to start showing results. Alas, there have been no miracles. So now I’m analyzing the last four weeks of training to see what I need to do to improve my results. Yes, I did workout every day in the last month — except for a couple of days when I worked extra long days at the station and was too exhausted to go to the gym. My excuse? Sometimes you just have to put sleep first and start fresh the next day. Yes, I did follow the daily meal plans – mostly. I admit that I did trade out a couple of the meals for frozen Weight Watcher dinners a couple of times to mix it up a bit. Probably not a good idea. I also had one bad binge day where I drank wine and ate onion rings. As you can imagine, this is a big no-no. So now I’m being extra good and following everything on the plan exactly. 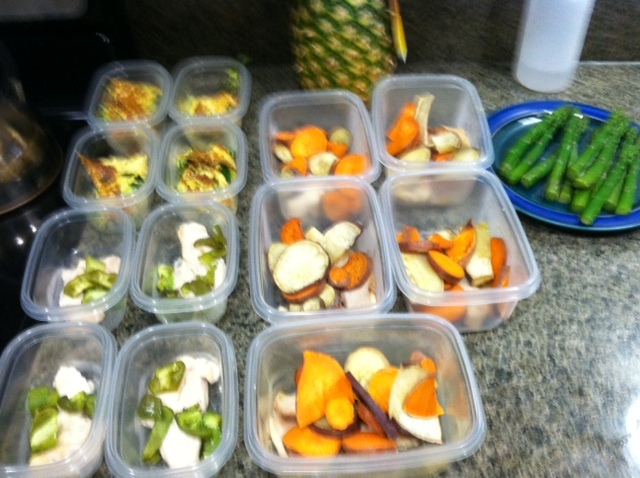 I even made all my meals for the week and put them in little containers so I could take them to work each day. And I bought a fashionable cooler bag that looks like a purse so I can carry all my cooked fish around without getting food poisoning. For the next few weeks, I am determined to be dedicated. I can do it. It’s only 31 days -and counting.